The quest started at The Bullring, the first known gambling hall in Fort Worth, the group was very excited about that fact and it was a great place to meet. The owners went through the history of the Hall and treated everyone to cookies and brownies. 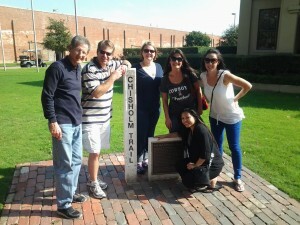 The Lee Financial group embarked on the Fort Worth Stockyards with enthusiasm, energy and a real competitive nature. They couldn’t wait to ride the bull at the Rodeo Zone, make a movie of the team conducting a jail break and solving the clues to this high tech game using Smart phones. Sarah Beattie the contact and organizer for the day’s events chose the teams very carefully; she placed people in non-leadership roles to be the team captains and mixed up departments so everyone worked with different people. This group was competitive to the end as we summarized the event the group looked at the pictures that everyone took, adding and subtracting points for not following directions, wrong answers and upside down photos all got huge laughs. Richie Lee shook our hands along with a few others and said “this was great and thank you for being a part of our day”.